On July 1, 2016, five gunmen entered the Holey Artisan Bakery café in the affluent Gulshan area of Dhaka, Bangladesh. During a 12-hour siege, 20 hostages and 2 police officers were killed. Most of the victims were foreigners. The majority of victims came from Italy and Japan: nine and seven casualties respectively. The foreigners were brutally murdered with sharp swords and knives. This incident has been a wake-up call for the government to strengthen security in order to thwart Islamic fundamentalist groups. While there have been isolated incidents against foreign nationals, secularists, and queer activists, the Holey Artisan Bakery attack is the largest terrorist act that Bangladesh has seen since independence. The gunmen were young men who had grown up in well-off families. Most were educated in English-speaking schools and led liberal lives. They targeted non-Muslims and tortured and killed those who were unable to recite the Qur’an. Religious revivalist movements are nothing new in Bangladesh. The Jamaat-E-Islami (Jamaat) is a major political party that has been accused of terrorist incidents by the governing Awami League. Some of their leaders were executed for war crimes during the Bangladesh Liberation War in 1971. Nevertheless, they are part of the system as a legal political party. Groups such as the Jumatul Mujuahedeen Bangladesh (JMB) and the banned Hizb-Ut-Tahrir have strongholds in the region as well. They advocate a ‘South Asian caliphate’ and aim to topple the secular Awami League in order to instate Sharia Law in the region. These organizations are militant and have been responsible for hatchet and beheading attacks against foreign nationals and citizens they consider ‘un-Islamic’. The Bakery attack, however, was claimed by ISIS itself. The group released photos of the scene during the massacre, as well as pictures of five militants who posed in front of the ISIS flag. One of the militants was a Canadian citizen, who was killed in a raid in Narayanganj, Bangladesh. While ISIS claimed the attack as its own, the government stated that the JMB was behind the massacre. This led to heavy criticism of Sheikh Hasina and the Awami League for their denial of ISIS’ presence in Bangladesh. The Awami League cracked down on terrorism by arresting thousands of political dissidents and launching raids against criminal safe houses. The opposition parties claim that these dissidents were their supporters and workers, but the raids proved beneficial as police were able to uncover the masterminds behind the Bakery massacre and foil subsequent terror plots. Nevertheless, it is important that Hasina recognize the danger of ISIS in Bangladesh. Young men have left Bangladesh to join jihadist groups. The militants behind the massacre underwent military training in Syria and some were reported missing by their families in 2015. After the Bakery massacre, the government urged families to report missing children, to ensure that they are caught before they leave the country. There are still instances of youths going missing without a trace. Japan and Italy were affected most by the attack, and both countries issued statements mourning their victims. There were two victims from the United States as well. The White House spokesman issued a response, stating that it was a ‘despicable act of terrorism’ and vowed to support Bangladesh in its efforts to fight terrorism. 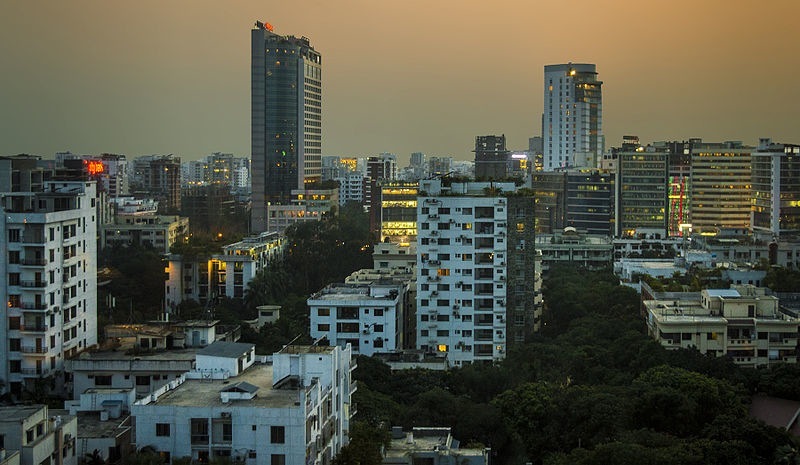 Foreign firms temporarily suspended visits to Bangladesh for fear of their employees’ being targeted in the country, but most countries and firms are determined to continue investing in the nation. China and Japan are offering billions of dollars in infrastructure projects, and the World Bank has pledged one billion dollars to assist children in poverty. Bangladesh may have an unsteady political atmosphere, but its economic influence is rising in the realm of international trade. The Bakery opened its doors again on January 11 2017, six months after the attack. It moved to another location, inside a mall, a few blocks away. Foreign nationals were seen frequenting the café. While it will take time to heal the wounds, the reopening is a small victory for the community, and for Bangladesh itself. Photo: View of Gulshan (2016), by Ahnaf Saber via Wikimedia Commons. Licensed under CC BY-SA 4.0.